Before we go much further we need to say that we received prototype copies of the game – although they’re very polished for prototypes. So the images we share and the comments we make about the components are based on an unfinished product. 49 Cards–Which includes 5 starting cards, 10 Lily Pad cards for each player, and 4 Player Aid cards. 64 Markers–14 Frog cubes and 2 Bullfrog cylinders for each player. Each player picks a color and takes the matching set of cards and markers. Then you place the 5 starting cards on the table: the Log card, and then the four starting Lily Pad cards are placed next to it in then shape of a cross. Players then shuffle up their cards, and draws a hand of 3 cards. 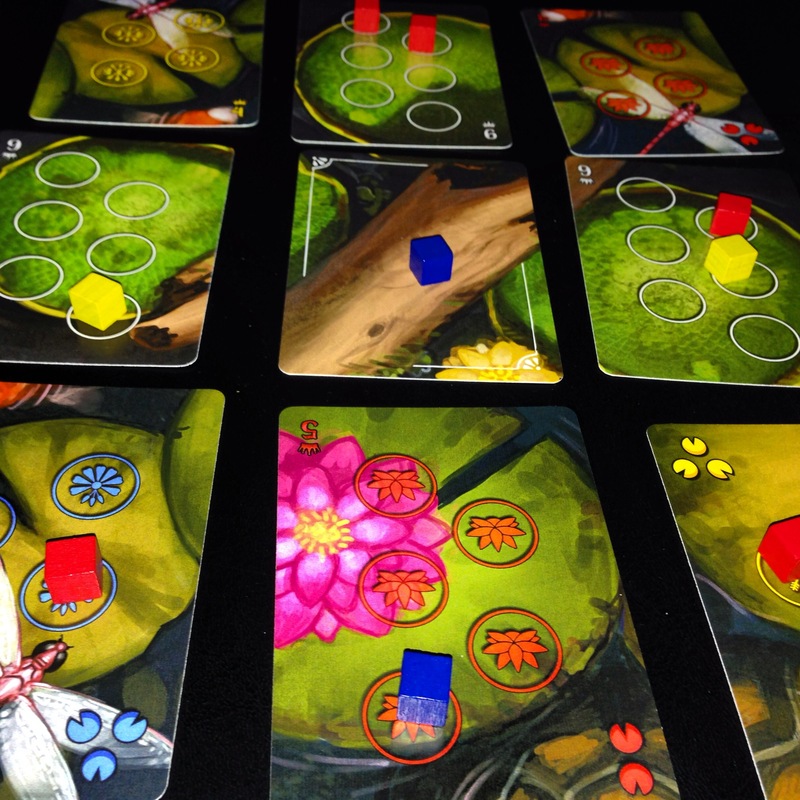 Each of the Lily Pad cards has a number of spaces on them to hold Frogs/Bullfrogs, as well as a number of actions denoted by small lily pad icons in the top left corner. The number of spaces determines how many Frogs and Bullfrogs can be placed on a card. One of the starting cards is a Log card; there’s no limit to the number of Frogs/Bullfrogs you can place here, but there are special rules as to how they make it there. 1 – Play a Lily Pad card from your hand. When you play it, it must be orthogonally adjacent to a card already in play. 2 – It’s action time. The card you played will have a certain number of lily pad icons on it, which determines how many actions you get to perform during this phase. Here are the actions available to you at this time. Deploy–You can place a Frog or Bullfrog on any open space on a lily pad card in the same row or column as the card you just played. You can’t Deploy to the log card and you can’t play more than 2 markers on any one card. If you run out of markers you can take a previously placed marker and move it somewhere else–using the same rules, of course. Sabotage–This lets you to move an opponents Frog–not Bullfrog–from a card in the same row or column as the card you played to an adjacent card. You can move someone to the Log card this way. You cannot, however, move Frogs that are already on the Log card–once they’re there, they stay there. 3 – Score a Lily Pad. 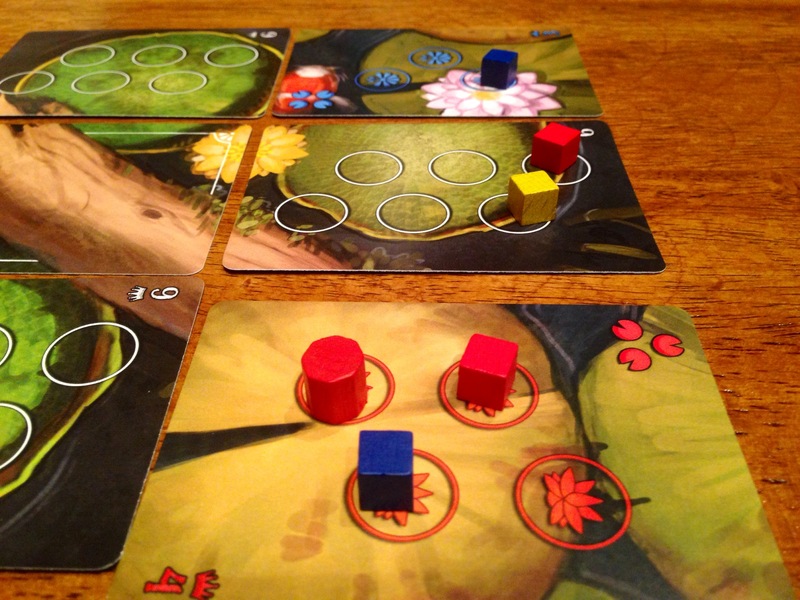 If at the end of a player’s turn there are any Lily Pad cards that have no empty spaces, a battle breaks out and those cards score – the active player chooses the order if there’s more than one to score. All frogs from the losing players, then all Bullfrogs from the losing players. Then all Frogs from the winning player, and finally all Bullfrogs from the winning player. So no more than 4 Frogs and/or Bullfrogs will ever jump from a scored card. Remaining frogs are returned to the player’s supply–except Bullfrogs, which are removed from the game! Once you jump Frogs the winning player takes the card and places it in a score pile in front of him. After you remove all cards that score, if any cards are now unconnected from the main group, you have to fix that by sliding the cards. You can move the stray cards anywhere around the main group that you want, so long as it ends up orthogonally adjacent. 4 – Draw a new card. Play now passes to the next player. 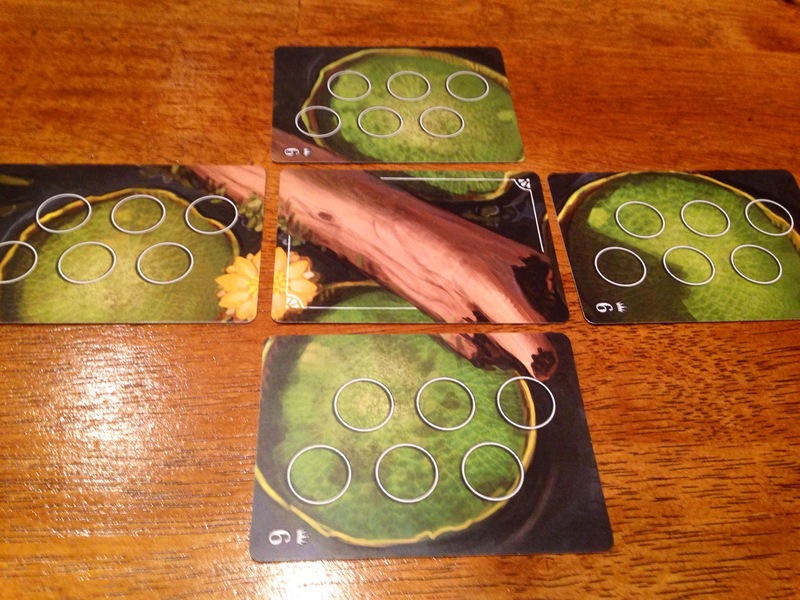 The game ends after each player plays all of his or her Lily Pad cards; then a final scoring takes place. Players total up the VPs on each of their won Lily Pad cards, and they receive an extra point for Lily Pad cards of their own color in their score pile. Players also score a point for each Frog, and 2 points for each Bullfrog, they have on the Log card at the end. Finally, the player with the highest combat value on the Log card gets a bonus 3 points. The player with the most points wins! Firestone–This game surprised me. My first thought was, “Frogs? Cards? Uh, I guess…” But this is a good little area-control game! There are subtleties, and plenty of room for clever plays. And it plays quickly! Jeremiah–Yeah, when I heard it was essentially a frog turf war my first thought was: Is this some sort of game themed on a never-released re-imagining of Watership Down? Turns out that we often find games with unusual themes turn out to be solid titles – Viticulture, Heartland Hauling, and Zeppeldrome, anyone? Firestone–The cards are colorful, and evocative, and easily convey the information they need to. I suppose my one “complaint” about the game is that I’d love to see more of artist John Ariosa’s work on the cards. I’ve been a fan of his since I first saw his work on Tooth & Nail Factions, and the artwork on the cover is no different. I’d love to see more, but that’s not really a complaint. It’s just wanting more of what I like. Jeremiah–Yeah, while the art on the cards is definitely top notch, and streamlines the game play, they’re very much designed with function over form. But I think putting more onto the cards would definitely muddle up the game and look forced. Firestone–I played this with my 9-year-old, and he was able to handle it easily. I could see the wheels turning, and watch him start to see combinations and ways to score. The 3-player game is a little more chaotic, but still doable. I wouldn’t play this with 4. There’s just too much going on between your turns, and a lot of chaos. But I’d happily play this with 2 or 3. Jeremiah–I could see a 4-player game getting over bearing, or at least leading to some analysis paralysis, but that wouldn’t keep me away from it. I played with 2 and 3 as well. My 7-year old loved it. My 5-year old enjoyed it too, but needed a little extra coaching along the way to help him make better decisions. It’s an easy game to learn though, so even if a younger player doesn’t get all of the intricate strategies that are involved, they can still have fun with it, and that makes this a really solid game. Easy to learn, but many levels to master. Firestone–This game is a great introduction to the area-control genre. It was that, exactly, for my son. I got to sit down with him and say, “Okay, this is called an area-control game…” He’s not ready for El Grande or Torres, but he’s close. And this game got him closer. Jeremiah’s Final Verdict–I’m so glad that there are games like this that challenge my preconceived notions. I often go into a game with some sort of opinion about it before I play it. I like to think I’m open minded enough to know that I could be wrong, and I’m pleased when I find out that I a–unless, of course, I think I’m going to love a game and it turns out to be a clunker. Games like this stretch me not only as a gamer but as a person, to not give up on some notion that I have about a game, a person, or whatever. I thought the theme would have made for a sub-par game; turns out I was wrong. This is a winner. Play it with your family and friends! 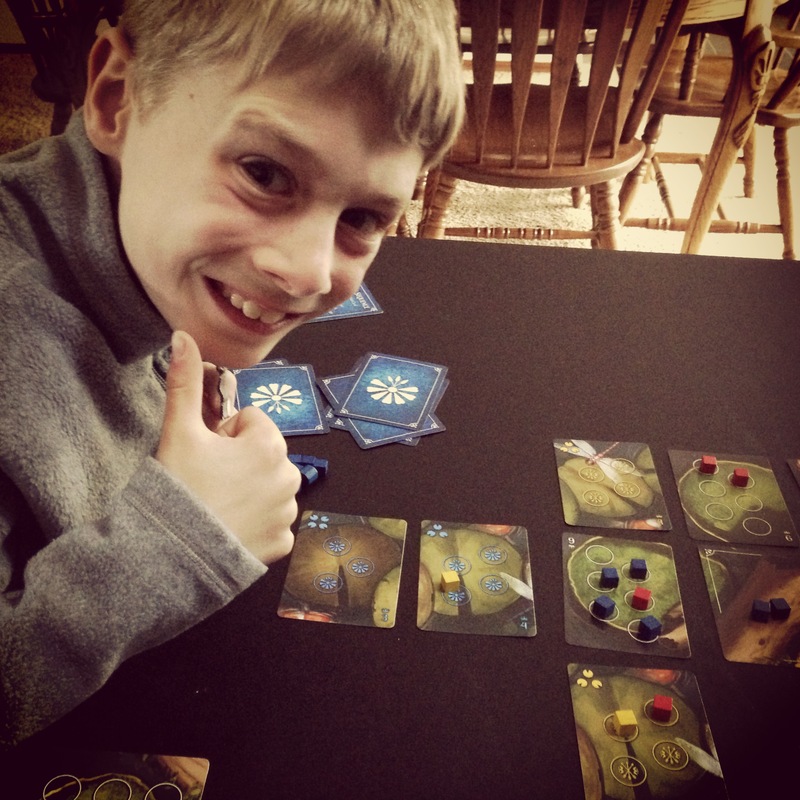 Firestone’s Final Verdict–This is a great family game. This is a great filler for gamers. I admit I was skeptical of the theme, but I’m a believer now. This is a fun, fast, and clever area-control game. I’ll wrap it up with a quote from my 9-year-old: “Dad, this game is really fun!” I agree. Bullfrogs is on Kickstarter right now, so go check it out! Theology Of Games would like to thank Thunderworks Games for providing a prepublished review copy of Bullfrogs. This in no way affected our opinions.